Civil War general, U.S. Congressman, and Governor of Ohio, Rutherford Birchard Hayes served as nineteenth President of the United States from March 3, 1877 to March 4, 1881. Rutherford Birchard Hayes was born on October 4, 1822, in Delaware, Ohio. He was the son of Rutherford Hayes and Sophia Birchard. Hayes never knew his father, who died ten weeks before his son’s birth. Sophia Hayes raised Hayes and his older sister with help from her brother, Sardis Birchard, a prosperous businessman who lived in Lower Sandusky (modern-day Fremont), Ohio. Hayes attended common schools in Delaware before enrolling in the Methodist Norwalk Seminary in Norwalk, Ohio in 1836. In 1837, he attended a preparatory school in Middletown, Connecticut. He entered Kenyon College in Gambier, Ohio in 1838 and graduated with honors in 1842. Hayes then attended Harvard Law School and graduated in 1845. After graduating from Harvard, Hayes was admitted to the Ohio bar and opened his own law practice in Lower Sandusky in 1845. Hoping to expand his practice, Hayes moved to Cincinnati, Ohio in 1850 and opened a law office with John W. Herron. While living in Cincinnati, Hayes became engaged to Lucy Ware Webb in 1851, and the couple married on December 30, 1852. A staunch abolitionist, Hayes’s defense of escaped slaves raised his profile in the newly emerging Republican Party. Unlike most Republicans, Hayes did not favor warfare to prevent the South from seceding from the Union when sectional differences escalated prior to the outbreak of the Civil War. Nevertheless, once the war began, Hayes lobbied Ohio Governor William Dennison for a military command. Dennison appointed Hayes as a major in the 2nd Regiment Ohio Volunteer Infantry on June 27, 1861. Although Hayes lacked any formal military training, he proved to be an able and active leader throughout the war. Soon after receiving his commission, he participated in the Battle of Carnifex Ferry (September 10, 1861) in western Virginia. On October 24, 1861, Hayes was promoted to lieutenant colonel. At the Battle of South Mountain (September 14, 1862), Hayes was shot in the arm, the first of five wounds he received during the war. On October 24, 1862, Hayes was promoted to colonel and assigned to command the first brigade of the Kanawha Division as a brevet brigadier general. Hayes’s division skirmished with John Hunt Morgan’s cavalry during the Battle of Buffington Island (July 19, 1863). At the Battle of Cloyd’s Mountain (May 9, 1864), Hayes led a charge that drove Confederate troops from their entrenchments. Toward the end of the war, Hayes participated in the Shenandoah Valley Campaign of 1864, seeing action in Hunter’s Raid on Lexington (June 11, 1864), the Battle of Lynchburg (June 17 and 18, 1864) the Second Battle of Lexington (October 19, 1864), and the Battles of Opequon Creek (September 19, 1864), Fisher’s Hill (September 22, 1864), and Cedar Creek (October 19, 1864). Hayes was promoted to brigadier general of volunteers on October 9, 1864 and brevetted to the rank of .major general on March 3, 1865. While Hayes was serving in the Army of the Shenandoah, Ohio Republicans nominated him for a seat in the United States House of Representatives from Ohio’s 2nd Congressional District. Despite the fact that Hayes refused to campaign for office while serving in the military, he won the election in November 1864. Hayes served in the 39th and 40th Congresses from March 4, 1865 to July 20, 1867. While in Congress, he supported civil rights for freed slaves and voted with the Republican majority on Reconstruction legislation. On July 20, 1867 Hayes resigned his seat in Congress to campaign for the office of Governor of Ohio. In November he won a closely contested election over Democrat Allen G. Thurman by a margin of 2,983 votes of 484,603 votes cast. Hayes was elected to a second term as governor in 1869. Choosing not to seek a third term, Hayes was an unsuccessful candidate for the House of Representatives in 1872. Following his failed Congressional bid, Hayes moved his family to the Birchard estate in Fremont, Ohio and briefly retired from politics. By 1875, however, he reentered the political arena, and Ohio voters elected him to serve a third term as governor. In June 1876, the Republican National Convention met in Cincinnati, Ohio. After six votes, delegates were deadlocked over their choice for a nominee for the office of President of the United States. On the seventh vote, Hayes emerged as a dark horse candidate and secured the nomination on June 16. In November, Hayes defeated Democrat Samuel J. Tilden in one of the closest and more controversial elections in United States history. Although Tilden received more popular votes than Hayes, his total of electoral votes was one short of the number he needed to secure the election. The Hayes camp challenged the election results in four states (Florida, Louisiana, South Carolina and Oregon). Congress was called upon to settle the dispute but was unable to do so. Instead, Congress established a nonpartisan electoral commission to determine which candidate prevailed in the four disputed states. The commission declared Hayes the winner in each state. In each case, the eight Republican members voted for Hayes and the seven Democrats voted for Tilden. In what became known as the “Wormley House Bargain,” Hayes became president. He agreed to end Reconstruction in the South, ordering the occupying Northern troops to return to the North. Hayes also agreed to appoint a Southerner to his cabinet. Upset by the outcome of the election, many Americans, especially Democrats, derisively referred to Hayes as “Rutherfraud B. Hayes” and “His Fraudulency” throughout his presidency. Hayes resigned his seat as Governor of Ohio on March 2, 1877 to assume the presidency. The next day he was sworn in as president during a private ceremony at the White House. Two days later, on March 5, Hayes was publicly inaugurated. During his presidency, Hayes withdrew the last Federal troops from the South, officially ending the Reconstruction Era. Nevertheless, he continued to champion rights for black Americans. In 1877, Hayes dispatched Federal troops to several cities to limit violence and end rioting by striking workers during the Great Railroad Strike of 1877. During his term in office, Hayes also advocated for civil service reform, a position that made him unpopular with politicians in both major parties. In 1880, Hayes fulfilled his pledge not to seek a second presidential term and retired to private life in Fremont. For the next decade, he advocated for numerous social reforms as a private citizen. 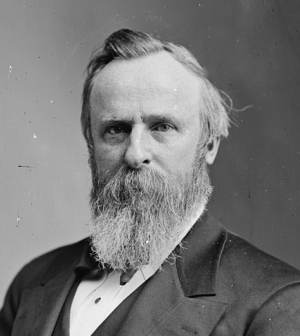 Rutherford B. Hayes died of complications from a heart attack at his home on January 17, 1893. He was interred at Oakwood Cemetery in Fremont, Ohio. In 1915, Hayes’s remains were re-interred on the grounds of his estate, Spiegel Grove, in Fremont. One year later, the Hayes Commemorative Library and Museum, the first presidential library in the United States, was opened at Spiegel Grove. Rutherford Birchard Hayes was an American military and political leader during the 19th century. Born in Delaware, Ohio, Hayes achieved the rank of brigadier general and brevet major general in the Union army during the American Civil War. After the war, Hayes served in the U.S. House of Representatives, and as Governor of Ohio. In 1876, Hayes won one of the more controversial elections in U.S. history to become the 19th President of the United States.